LIRNEasia is a pro-poor, pro-market think tank that conducts in-depth, policy-relevant research on infrastructure industries including ICT sectors. 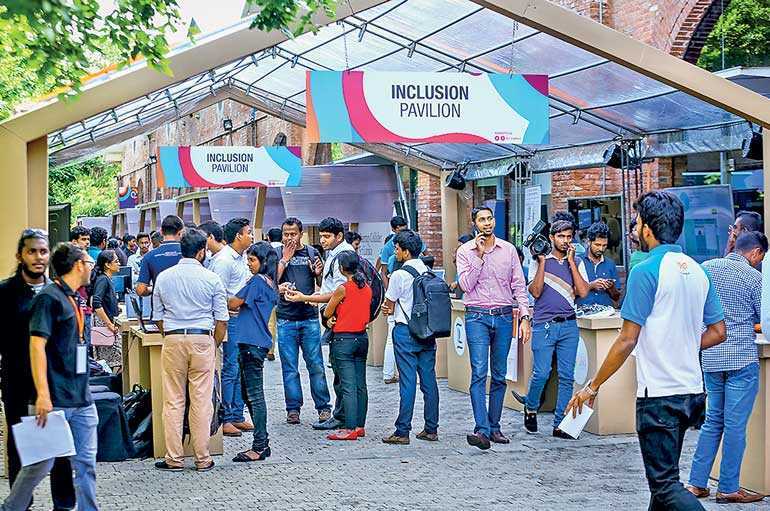 The organisation showcased three innovative projects at the Inclusion Pavilion- Bhasha Buddy, Mero Sathi and Screen Access For All (SAFA). In addition to this, the Center for Biomedical Innovation (CEBI), a multidisciplinary research center established by the University of Moratuwa, displayed prototypes including a meal assisting robot, joint ankle exoskeleton, screening methods to identify diabetes by identification of macro-vascular tortuosity, and 3D printed prosthetics. CEBI is an initiative towards collaborative research between engineering and medicine in the area of biomedical device development and commercialisation. 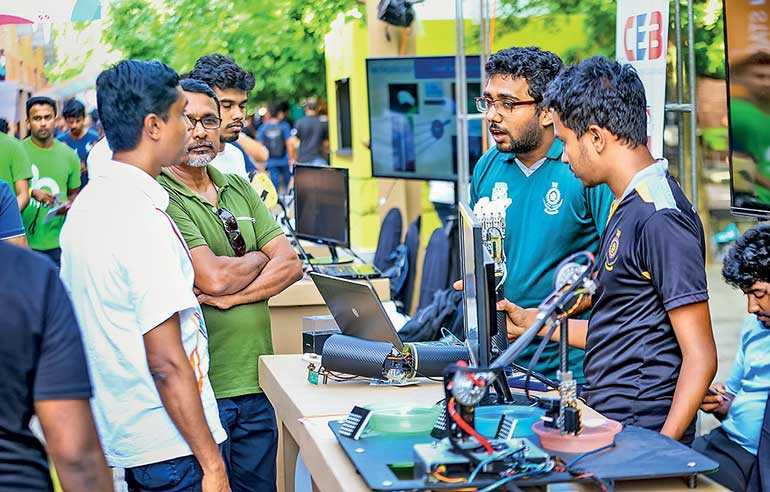 Another university participant was the Language Technology Research Laboratory (LTRL) of the University of Colombo School of Computing (UCSC) which demonstrated several innovative technologies at the event. One of their projects aims to enhance human-computer interaction by developing applications that enable users to easily access the computers in local languages through the Text To Speech (TTS) System for Sinhala language while work is being carried out to develop a similar system for the Tamil language. 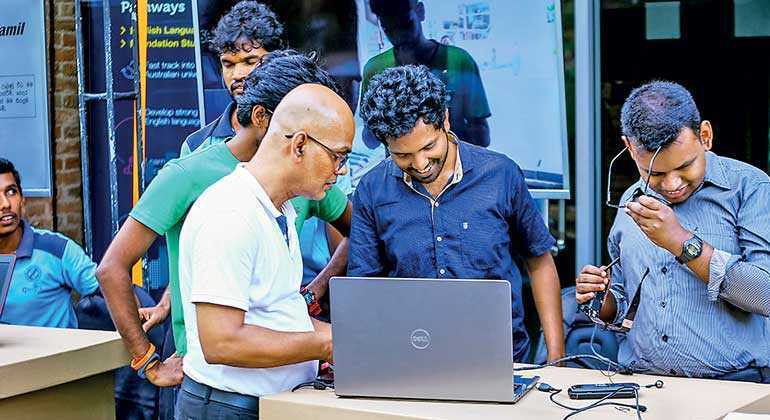 They also displayed an Optical Character Recognition (OCR) System that aims to develop an accessible and distributable OCR engine to detect printed Sinhala characters that can be embedded in third-party applications. An innovative technology that caught the visitors’ attention was BlindNavi, a successfully-prototyped haptic outdoor navigation system for visual impaired people to use in their day-to-day lives in order to reach their destinations safely. Designed and developed by InBits, it consists of two interconnected main components, a wearable device and a navigational direction providing server. The Ahanna Foundation displayed their ‘Sanvaadha’ mobile app, specially designed and developed to help deaf people communicate in their day-to-day life. The app contains animated sign language GIF words to create messages which enable users to generate complex paragraphs or sentences which can be sent via popular messaging platforms such as Facebook Messenger and WhatsApp. The sentences can also be translated into Sinhala and used in day-to-day interactions. Additionally, Enable Lanka Foundation presented a wide array of assistive technology gadgets including Lisn Audiobooks, Bemyeyes and Braille2text. The Foundation is a network of young professionals and high-achieving millennials with various areas of expertise and backgrounds and a special focus on enabling the citizens of Sri Lanka with skills and entitlements through innovative solutions and approaches. Organised by the Information and Communication Technology Agency of Sri Lanka (ICTA), Disrupt Asia 2018 was supported by the Ministry of Telecommunication, Digital Infrastructure and Foreign Employment. The Conference part of Disrupt Asia 2018 brought to light the need for policy and strategy while entrepreneurs shared their insights, successes and failures and inspired current and potential entrepreneurs. Several top experts from USA, Netherlands, UK, Singapore, Bangladesh, Philippines, India and Sri Lanka expressed their views on Artificial Intelligence, digital marketing, security and set the stage for disruptive thinking around STEAM education, creative industries and social entrepreneurship.